CHICAGO--(BUSINESS WIRE)-- Hyatt Hotels Corporation (NYSE: H) and Macerich (NYSE: MAC) today announced the opening of Hyatt Regency Tysons Corner Center, the first new-build, full-service hotel in Tysons Corner to open in more than 20 years. 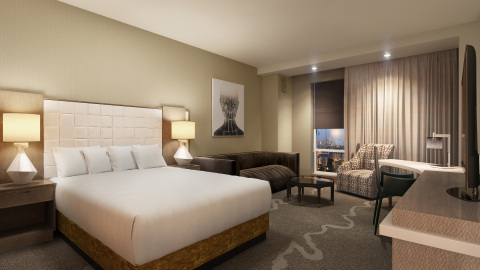 The 18-story, 300-room Hyatt Regency hotel is designed to offer business and leisure travelers an upscale hotel experience, featuring rich design, modern guestrooms and state-of-the-art meeting space – all in the heart of the trendy downtown Tysons Corner. Situated in one of the most dynamic and visited communities is the metro area, Hyatt Regency Tysons Corner Center is part of Macerich’s breakthrough Tysons Corner Center mixed-use expansion, which includes the award-winning Tysons Tower trophy office building, VITA luxury apartments (expected to open later this year) and new restaurants, all built around The Plaza, an elevated, 1.5 acre public space with its own stop on the Washington Metro Silver Line. The center of this new vertical urban hub is the 2 million-square-foot Tysons Corner Center mall, drawing millions of visitors each year. The expanded Tysons Corner Center is quickly becoming a new downtown hub of Greater Washington D.C. and Northern Virginia. The new hotel is in close proximity to the Dulles Technology Corridor, world-class medical care and downtown Washington D.C. Additionally, the hotel is conveniently located 15 miles from both Washington Dulles International Airport and Ronald Reagan National Airport. The vibrant and upbeat energy of Tysons Corner is captured in the style of the hotel’s upscale, urban accommodations. The hotel features 300 modern guestrooms, including 17 stylishly appointed suites and one Presidential Suite. Panoramic views from the guestrooms include sweeping views of downtown Tysons Corner and the bustling Plaza at Tysons Corner Center. The contemporary guestroom design evokes the atmosphere of a private apartment with 9-foot ceilings, floor-to-ceiling windows and a separate seating area. Guestrooms are designed with a neutral color palette, set against warm wood tones and adorned with a collection of minimalistic and conceptual artwork. Distinct room features include marble bathrooms with rain shower heads, night-light foot sensors, 48-inch flat panel televisions with remote control, and the luxurious Hyatt Grand Bed®. Social spaces take on a new meaning at Hyatt Regency Tysons Corner Center. The smartly configured lobby, complimentary Wi-Fi throughout guestrooms and public spaces, and convenient access to power outlets, meals and snacks are all designed to keep guests in sync with people and information. Guests wishing to upgrade to the exclusive Regency Club® lounge will enjoy continental breakfast, midday snacks, and hors d’oeuvres and desserts in the evening. The hotel’s 24-hour StayFit® fitness center features state-of-the-art strength training machines and cardiovascular equipment, along with an indoor swimming pool. The hotel also provides guests with the convenience of an open workspace with computer stations and printing services, babysitting, currency exchange, and self-park or valet parking options. Hyatt Regency Tysons Corner Center is home to Barrel & Bushel, a contemporary American-style restaurant and bar located on the Plaza level. The barrel-forward restaurant offers guests regionally-inspired food, the best local and craft beers available with 22 beer taps, more than 30 handpicked bourbons, and handcrafted cocktails. Barrel & Bushel’s menu will boasts fresh, handcrafted delicacies including house-made sausages, artisan desserts and handmade fudge. Private dining at Barrel & Bushel is also available for small parties. The restaurant also offers Barrel & Bushel Express, a delivery service for guests who wish to eat-in. In addition to Barrel & Bushel, Tysons Corner Center offers a variety of dining options within a short walk from the hotel. Nearby restaurants include the upscale The Capital Grille, as well as more than 50 dining selections, from fast casual to food court options, located at Tysons Corner Center. Located in the heart of Northern Virginia’s Tysons Corner business district, the hotel is close to the area’s technology and corporate centers, which are home to more than 400 leading companies and near the Pentagon and Defense community. Hyatt Regency Tysons Corner Center has more than 15,000 square feet of meeting space to accommodate a variety of groups or occasions. The beautiful 7,000-square-foot Regency Ballroom is able to host more than 600 guests with its modern 21-foot-high ceilings and elegant lighting for all occasions, and it can be separated into three small rooms if desired. In addition to the sophisticated ballroom, the hotel has 14 breakout rooms located on the second and fourth floors; the majority offer private terraces with natural light and city views. Hyatt Regency Tysons Corner Center provides an inclusive wedding experience in a chic, modern and ultra-contemporary setting. With the ability to host more than 600 guests, the hotel’s ballroom can be transformed into an elegant wedding venue. The hotel also provides ideal settings for intimate family receptions, rehearsal dinners, bridal showers, post-wedding brunches, and more. The hotel’s experienced event teams and wedding planners are available to assist in planning every event detail, and the catering team can help to design the perfect menu, wedding cake, hors d’oeuvres, cocktails, and more for the event. The hotel has relationships with local vendors including award-winning bakeries, florists, DJs, photographers, hair salons, and more. For guests who want to venture out, the hotel lobby connects them to the Tysons Corner Center shopping mall, one of the world’s largest upscale shopping malls with more than 300 stores and restaurants. Guests can enjoy some of the best shopping and most popular stores including American Girl Doll, L.L. Bean, Bloomingdale’s, Apple, Tesla Motors, Under Armour, and more. Also located at the shopping center, AMC Theaters provides guests with easy access to 16 state-of-the-art theaters, including IMAX®, RealD 3D® and AMC ETX auditoriums. Just a few steps outside of the hotel, guests are able to experience The Plaza, a one-and-a-half acre elevated outdoor walkway that features year-round activities and events including family movies and concerts, festivals such as Oktoberfest, ice skating in the winter, outdoor summer concerts, life-sized board games, bicycle and walking paths, and a gigantic pirate ship playground for children to enjoy. Hyatt Regency Tysons Corner Center is located within easy driving distance to the world-renowned Wolftrap Center of the Performing Arts, The Patriot Center, and many historic sites such as the Manassas and Bull Run Battlefields, Mount Vernon, and many monuments and museums. It is also near several wineries and breweries on the Northern Virginia area that offer tours of their vineyards and brewing facilities. Guests wishing to experience Washington D.C. will enjoy easy access to the Silver Line Metrorail Station across The Plaza, which provides an easy 30-minute ride to Union Station. Be in the center of it all at Hyatt Regency Tysons Corner Center. Connected directly to Tysons Corner Center, one of the nation's most successful regional shopping centers, and the new Tysons Corner Metrorail Station, convenience and accessibility are built in at Hyatt Regency Tysons Corner Center. The hotel boasts 300 guestrooms, including 18 suites, a vibrant restaurant with a private dining area and seasonal outdoor seating, a bar and lounge, a pool and a fitness center. Additional amenities include a lobby workstation, complete with two computer stations and a printer, and an exclusive Regency Club® level for the discerning traveler. The hotel offers an executive conference center to complement the 15,500 square feet of meeting and event space, including a 7,000-square-foot ballroom. For more information about Hyatt Regency Tysons Corner Center visit: tysonscorner.regency.hyatt.com. Hyatt Regency is an energizing hotel brand that connects travelers to whom and what matters most to them. More than 140 conveniently located Hyatt Regency urban and resort locations in over 30 countries around the world serve as the go-to gathering space for every occasion – from efficient business meetings to memorable family vacations. The brand offers a one-stop experience that puts everything guests need right at their fingertips. Hyatt Regency hotels and resorts offer a full range of services and amenities, including notable culinary experiences; technology-enabled ways to collaborate; the space to work, engage or relax; and expert planners who take care of every detail. For more information, visit hyattregency.com or facebook.com/HyattRegency. Macerich currently owns 54 million square feet of real estate consisting primarily of interests in 51 regional shopping centers. Macerich specializes in successful retail properties in many of the country's most attractive, densely populated markets with significant presence in the Pacific Rim, Arizona, Chicago and the Metro New York to Washington, DC corridor. Additional information about Macerich can be obtained from the Company's website at www.macerich.com. Hyatt Hotels Corporation, headquartered in Chicago, is a leading global hospitality company with a proud heritage of making guests feel more than welcome. Thousands of members of the Hyatt family strive to make a difference in the lives of the guests they encounter every day by providing authentic hospitality. The Company's subsidiaries develop, own, operate, manage, franchise, license or provide services to hotels, resorts, branded residences and vacation ownership properties, including under the Hyatt®, Park Hyatt®, Andaz®, Grand Hyatt®, Hyatt Centric™, Hyatt Regency®, Hyatt Place®, Hyatt House®, Hyatt Zilara™, Hyatt Ziva™, Hyatt Residences® and Hyatt Residence Club® brand names and have locations on six continents. As of December 31, 2014, the Company's worldwide portfolio consisted of 587 properties in 50 countries. For more information, please visit www.hyatt.com.